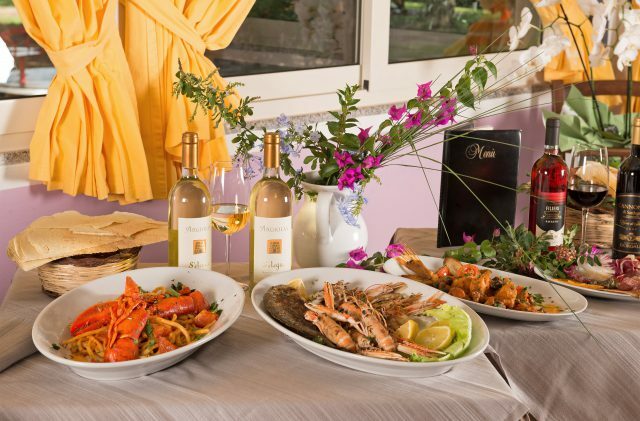 At Ristorante Cala Ginepro, you can savour the simplicity and authenticity of the local cuisine, both in the dining room and, better still, in the outdoor area, immersed in the natural surroundings of the campsite. The restaurant is open every day for lunch and dinner. The menu encompasses a wide range of local specialities, embodying the traditional flavours of Italy’s take on Mediterranean cuisine using typical Sardinian produce, such as fregola pasta infused with the flavours of the sea, kulurgiones (Sardinian ravioli) and the delicious sevadas (cheese-filled fritters) served with honey. Not to be missed are our selected local wines. Alongside table service, throughout the whole season there is also a convenient take-away service, to allow you to savour these wonderful dishes in the comfort of your own accommodation. By prior arrangement and registration at the campsite’s Reception, the Camping Cala Ginepro restaurant is open to the public. On any day of the week at Camping Cala Ginepro’s restaurant / pizzeria, both at lunch and dinner, you can forget about having to cook and choose instead from the plethora of freshly made authentic pizzas on offer, featuring classic or local ingredients. The pizzeria at Camping Cala Ginepro boasts a wood-fired oven, and the fragrant pizzas are made using dough with long proofing times. You really don’t want to miss this Italian delight, infused with the flavours of Sardinia, during your holidays at Cala Ginepro! If you’d prefer to eat lunch or dinner in the intimate surroundings of your accommodation, the convenient take-away service is available for all campsite guests. From April to October, you can celebrate your special moments at the Ristorante Pizzeria Camping Cala Ginepro. Whether it’s a birthday, a wedding or an important anniversary, there’s no better venue for the events you want to remember than the wonderful backdrop of Cala Ginepro. The staff at Reception will be delighted to give you a customised quote.